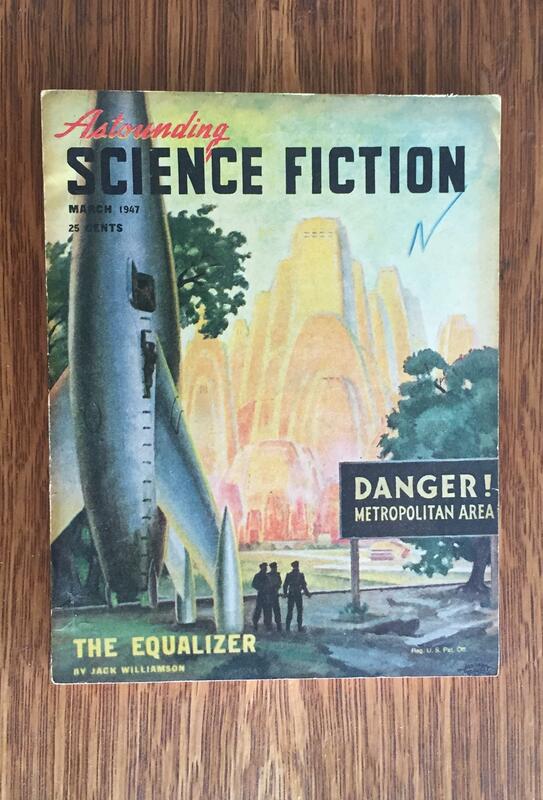 March 1947 issue of Astounding, cover by Hubert Rogers. This entry was posted in Archive, Reddit and tagged CoolSciFiCovers, Favourite, Reddit on 31/08/2018 by John. This entry was posted in Archive, Twitter and tagged dancow, Favourite, Twitter on 31/08/2018 by John. A short article (with a smaller photo illustration) on a very big topic appeared in Illustrated World in June 1921. The photo showed a remarkable plane constructed by aeronautical engineer Giovanni Caproni (1886-1957)–three planes, really. Three triplanes were attached to a floating Pullman-like fuselage, making this the largest/heaviest aircraft ever built at that time. It was 32′ high, 66′ long, and 130′ wide, and was made to seat 100 and make a transatlantic voyage. This was the “Noviplano” (the Caproni Ca. 6c, and translated in the article as “Nine-plannen”), and presented itself in an impressive if not complicated manner–it was a prototype, though, and was crashed and finished on its second flight. This entry was posted in Archive, Feedbin and tagged Favourite, Feedbin, JF Ptak Science Books on 30/08/2018 by John. This entry was posted in Archive, Twitter and tagged allindiaradio, Favourite, Twitter on 30/08/2018 by John. This entry was posted in Archive, Twitter and tagged Favourite, Siegel_Jan, Twitter on 30/08/2018 by John. This entry was posted in Archive, Twitter and tagged Favourite, SocialHistoryOx, Twitter on 30/08/2018 by John. This entry was posted in Archive, Reddit and tagged Favourite, history, Reddit on 29/08/2018 by John. This entry was posted in Archive, Twitter and tagged Favourite, Nullsleep, Twitter on 29/08/2018 by John. Michael Faraday achieved electromagnetic induction here at the Ri for the first time #OnThisDay in 1831. This entry was posted in Archive, Twitter and tagged Favourite, Ri_Science, Twitter on 29/08/2018 by John. This entry was posted in Archive, Twitter and tagged Favourite, moodvintage, Twitter on 29/08/2018 by John.